On this date in 1677, a totally unique royal marriage took place in England: the wedding of future co-monarchs. Mary, the daughter of King James II, married her cousin William, who was the Prince of Orange. (The date also happened to be the groom's birthday). Twelve years later, they ascended to the throne as King William III and Queen Mary II of England, and a special new crown had to be made for Mary so they could be crowned jointly. William and Mary have many legacies, but for my money, one of their most important achievements was the purchase of a particular jewel: the Stuart Diamond. 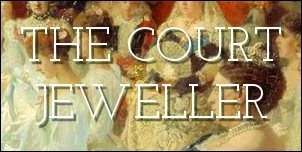 Today, the gemstone is owned by the Dutch royal family and is mounted in an elaborate nineteenth-century tiara (worn above by Queen Juliana). But it has had a varied and intriguing history, which you can explore below. Do you like the current setting of the Stuart Diamond, or would you like to see it reset in a new piece of jewelry?